Prioritisation therefore becomes a means of processing and executing between different options. In sales, not only are there a number of activities you can invest your time undertaking (new business development, nurturing prospects, account expansion, planning, etc. ), there are a number of ways to achieve each. Question 1: "What's My Motive?" Whether pursuing a goal or enacting a task, it is important to have clear objective and define what you want to achieve. Thinking in terms of outcomes and end results will enable you to remain clinical and focus on the task at hand. This applies both internally externally - i.e. what do you want to achieve from a meeting? From an email? In turn, this will also improve prioritisation and how you decide to allocate your time. Question 2: "Am I Memorable?" Your personal brand and the way you are perceived in the eyes of your clients/prospects will play a large role in whether someone has trust in the service you are delivering. Keeping front-of-mind will differentiate you from the competition. Each interaction therefore, provides the opportunity to gain a vote of confidence from each of your stakeholders and the contacts you want to influence. Question 3: "What did I learn?" Personal development is core to progressing within any role. Understanding how you can perform better, establishing greater market knowledge, and taking a step back to realise there is always more you can do to move forward will prevent you from stagnating. 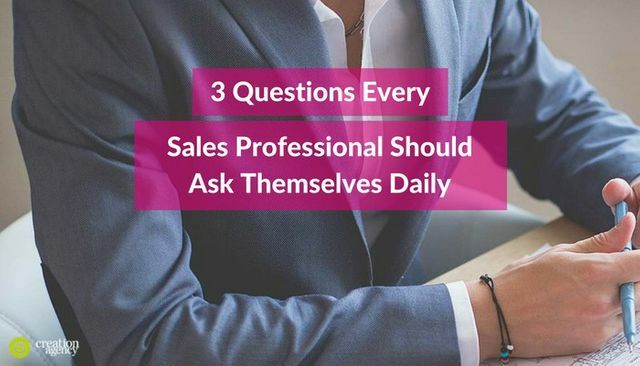 This question will help you address and resolve challenges you may encounter, deliver a superior service to your clients, and ultimately perform better throughout your career. Motive drives every action we take daily. Action takes place when you leave a lasting impression. Impressions are made by people. People that are experts are obsessed with learning. Learning is driven by asking the right questions daily.